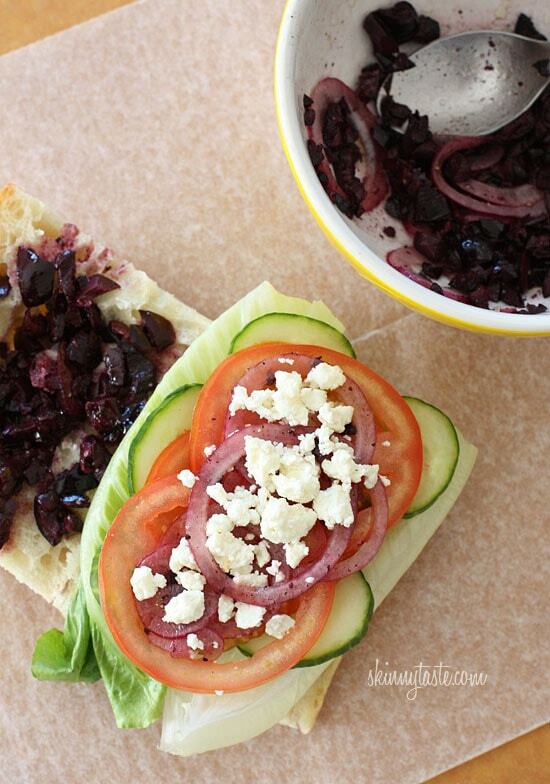 If you love a Greek Salad, then you’ll love this sandwich. Crisp Romaine lettuce, tomatoes, cucumbers, kalamata olives, feta cheese and red onion on ciabatta bread with a touch of oil and red wine vinegar. 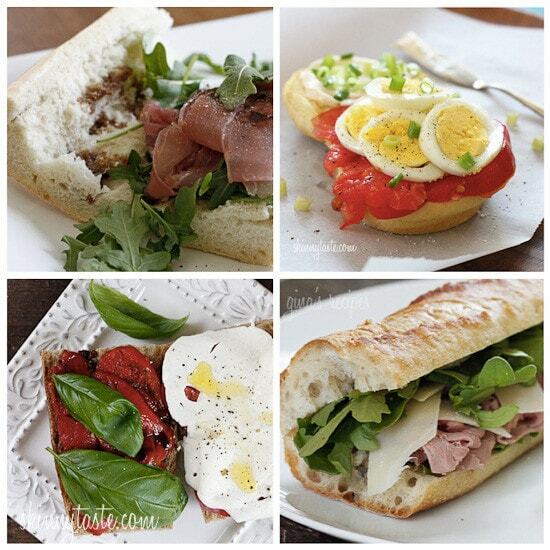 Other sandwiches I love that don’t require heating up are Avocado Egg Salad and Salmon Sandwich, Grilled Chicken Sandwich with Avocado and Tomato, and my favorite… Roast Beef, Arugula and Shaved Parmesan. Some of you have been asking me for more sandwich recipes to pack up for work, school or to eat on the road. 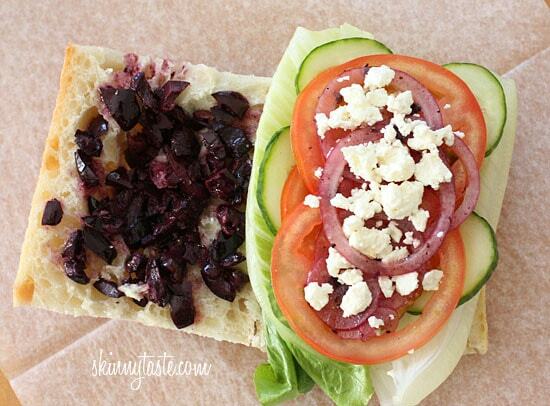 This is a great sandwich, it’s meatless but has plenty of flavor from the olives and feta. You can even add some sun dried tomatoes. I like to add the onions to the vinegar, this mellows out the sharpness of the onion, but completely optional. Can you make the olive mixture and save it in the fridge? 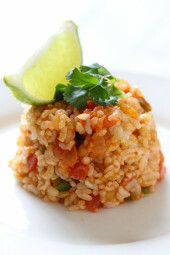 Planning on having these for my lunches this week, but don’t want the mixture to get soggy! I’m not going to put it on the bread until day of, but figured I’d make ahead. Your instructions are VERY confusing!! So, the red onion is added to the olives & spices & oil, yes? But then at the end you say "top with onion"…so top with additional onion?? Because i assume the olives & onions have been added with the spice/oil mix already, yes? & just out of curiosity: why are you cutting the sandwich in half again? so, you will actually end up with 8 mini sandwiches then, correct? Eating this right now. So good. I also added a very thin spread of sun dried tomato humus. Thank you! This sandwich transcends all awesomeness! It's especially nice when tomatoes are in season. Surprisingly filling too. I'm glad you floated it back to the top. I have added the ingredients to my list. This sandwich is so up my alley, is it 8 points plus for the whole sandwich or 8 points plus for a fourth of the sandwich? I'm confused but hopeful! The whole sandwich for 1 serving is 8 pts. I just had (a slightly modified) version for lunch and it was INCREDIBLE!! I normally wouldn't comment since I did modify it (I don't like olives so I left them out and used some sliced roasted red peppers instead, I also used slightly less vinegar), but vegetarian sandwiches are hard to find. This was SOOOO good and pretty unique! Thanks so much for an amazing new lunch recipe! This is a keeper for sure! crazy, i thought i found a recipe here for a wrap including tuna and roasted red peppers and tortilla factory wrap. SOund familiar anyone ? I made this tonight. I think having really good/fresh bread is probably key. Really yummy! This is so good! I added a little oregano to the dressing. I also put the feta in the dressing which secured it to the bread. Yum! This looks so delicious and big! I might half it and add some chicken 😀 Delicious! Cobb salad, club sandwiches, etc. I like the sound of using Greek salad flavours in a sandwich! I love love Reubens, but they leave much to be desired as far as calories/fat go. Also, my mother-in-law makes an awesome chicken salad recipe with dried cranberries and plain almonds. It's so perfect – adds a little tartness and some crunch! What kind of PB&J would you suggest for low points? There are lots varietes of each? I would love to see your take on it. Oh, this looks so good! It's on of those "why didn't I think of that" moments. lol, I have those often! Ohhh, yummy! This looks delicious!!! This sandwich looks delicious. I can't wait to try it! Also, I don't know how I missed the roast beef sandwich. I'm a huge fan. Where do you get that bread? It looks so good! I know you are a Trader Joes's shopper and I was very much looking forward to trying their new greek feta dressing but was disappointed about the amount of fat in it. This is a great way to have that greek dressing taste without all the fat. And, I LOVE LOVE ciabatta. 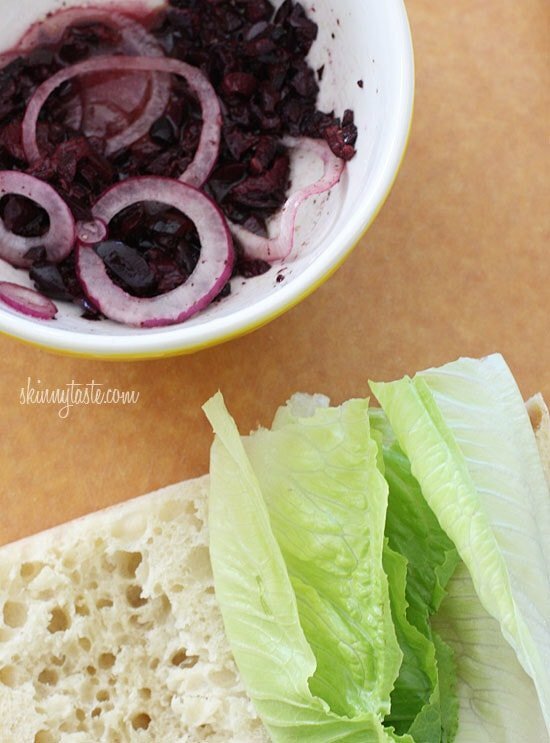 This sounds super delicious, but I bet it would be a lot more satisfying with a slice of roasted red pepper – I love them in my veggie sandwiches because they make them more filling without too many more calories! It's 8 points plus, yes with the bread. The old point system is 6 points. This is SOOOO up my Mr's alley! This looks great, looking forward to more sandwich recipes! I've been making stuff of your website for about 2 1/2 months now. I've lost 20 lbs! You make it so easy, thanks for what you do! Looks yummy minus the egg. What would be a good substitute for that? there's no egg in it. whenever I make a greek vinaigrette I add a splash of lemon juice to the red wine vinegar and olive oil / salt and pepper blend and some dried oregano. 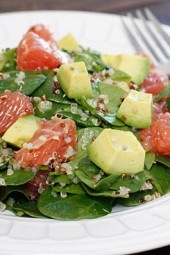 It just adds a little more depth of flavor to the dressing without extra points. Oooh, I second the request for a skinny muffaletta! Yum! Looks delicious! The egg, scallion, and tomato sandwich is my new favorite breakfast sandwich. Thanks for all the great recipes! This looks amazing! Love feta cheese! 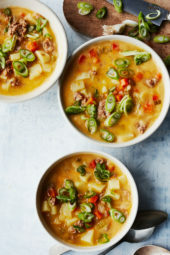 this looks delish – I will totally be giving this one a try!! 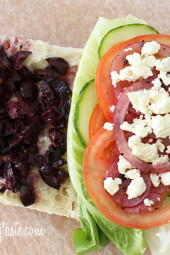 On second thought, I am really going to have that Greek Salad Sandwich for lunch today. No kidding. I have all the fixings and am really going to have it and I can hardly wait! WOW – those look so good! I could eat every single one of them right now!